I mean... yes, I am aware that it doesn't need to be February 14th to indulge in some whatever-covered strawberries... but I mean look at these things. They totally scream Be Mine. LOL. Here's what happened: I had a ton of strawberries that were on the verge of going bad. I had a major sweet tooth, and I had some extra yogurt laying around. (I also had some free time). So yeah... that was that. 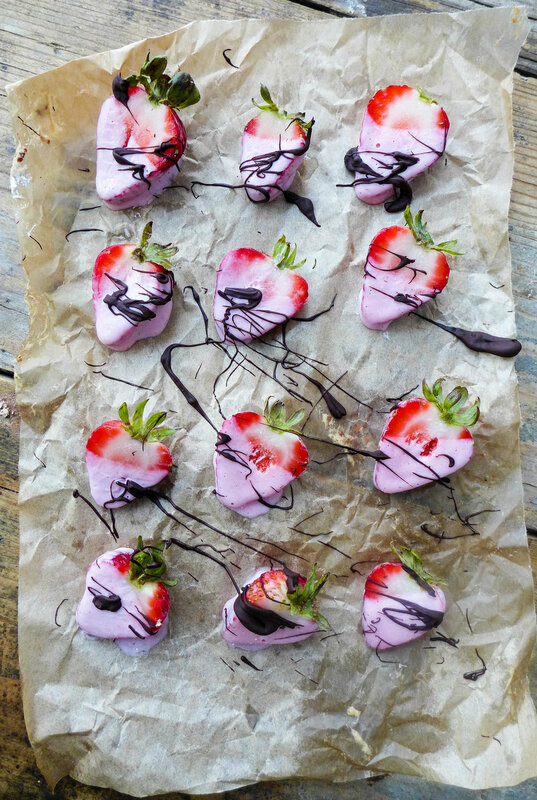 Yogurt Dipped Strawberries with a drizzle of dark chocolate for good measure, of course. I usually use So Delicious brand coconut yogurt. It's my favorite. They also have a greek-style almond milk yogurt that's pretty good too. And it's thicker if you like that. Anyway. I'll be sure to give you guys a reminder of these bad boys when February rolls around! HAHA. Til then.. they really do make a yummy and healthy snack. So go for it! No judgement. Thanks for stopping by. You guys are the best!